There are lots of known cloud storage providers these days on the internet ranging from official Google Drive to Apple’s iCloud and many others like Dropbox, SkyDrive, etc. But still one name is similarly popular to all of them i.e. MEGA. MEGA is offering cloud storage services since many years and they are best at providing the important privacy to all your files stored there. The app will be available very soon for Windows Phone and iOS devices but right now it’s only available for Android guys. A couple of days ago, they launched their first smartphone app starting off with the GooglePlay store. The app officially arrived at GooglePlay store on July 4, 2013 (stable version 1.0.2). Well, there are already lots of cloud storage apps available on the GooglePlay store so how MEGA going to attract customers as the mighty Google is also there with its Drive. The very eye catching feature MEGA offering to Android users right now is the free storage of 50GB and that too with their secure features. By secure features they mean to provide extra security to your files with unique keys which will be shared with none other than you, thus keeping your files private. Let me share all the features offered by the MEGA cloud storage Android app. 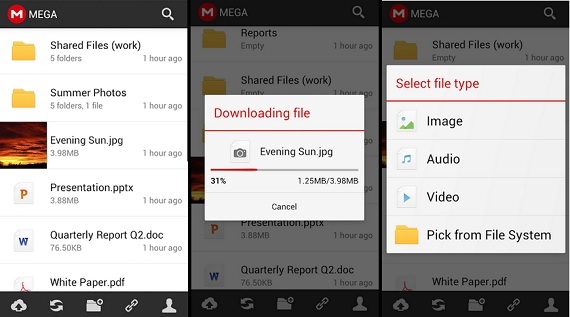 If you already got an account with MEGA then you can access to all your files from your Android smartphone easily with the help of this app. This is the first obvious benefit of having this app. Secondly the security or encryption which is provided to your files and folders stored online in their cloud is also provided on the smartphone app. So your files are still safe while you’re accessing via smartphone. Off course the downloading and uploading features are also there and additionally there is one Camera sync tool included which will upload all your photos taken from your device camera automatically after being activated. The additional feature is really good. Rest of the traditional file manager features are also there in the app. The only question may be coming in your mind may be of the UI. The UI of the app is elegant and simple to use. I’ve already tried it on my Sony Ericsson SK17i. As in case of any Android app, you’ve to download the app from GooglePlay store, don’t panic its free and then it will be installed on your device automatically. 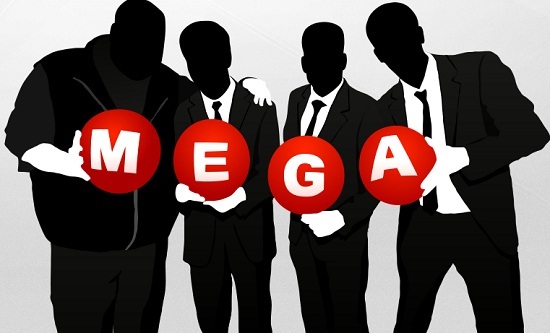 Start your browser and register for a free account on the MEGA official website. Once the app gets installed then login with your registered user name and password and there you go within the app. Go for options and there you’ll find camera sync tool and the logout option. Four options are there at the bottom upload, refresh, create new folder, linking and dashboard. In its future updates, more features will be coming to the MEGA Official app. If your storage requirements are not full filled by Google Drive or Free Dropbox storage then I’ll recommend you to try this app as 50GB storage is great to have for free. Do share your reviews down here in comments after going with the app.